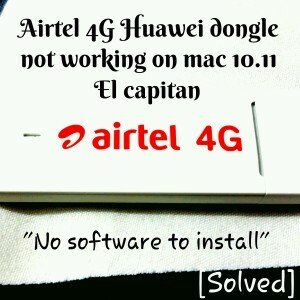 Airtel 4G Huawei dongle not working in mac 10.11 (el capitan) solution is here.
" no software to install "
I then was on google searching for solutions. I found many websites recommending to switch off rootless in Mac by turning on recovery mode to install the airtel 4G drivers and dongle. I suppose that is not necessary here. I just searched google for huawei global website. I entered huawei global website. I searched for the model number E3372. Direct search link. I downloaded, installed Stick mobile partner for mac 10.11 and boom airtel 4G hauwei dongle was detected as soon as i plugged in the dongle and opened the installed mobile partner software. I added new profile under profile management with dial no: *99#, APN: airtelgprs.com and saved it. I am now enjoying Airtel 4G on Mac 10.11 El Capitan. 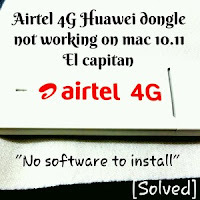 Hope you too do solve and enjoy Airtel 4G on your Mac. If you have upgraded your Mac from 10.10 to 10.11, i suppose that Airtel 4G can be accessed through Huawei modem configuration done in Mac Network preferences.